This series was produced during two two-week trips along the Kunene River in Namibia, where I grew up. 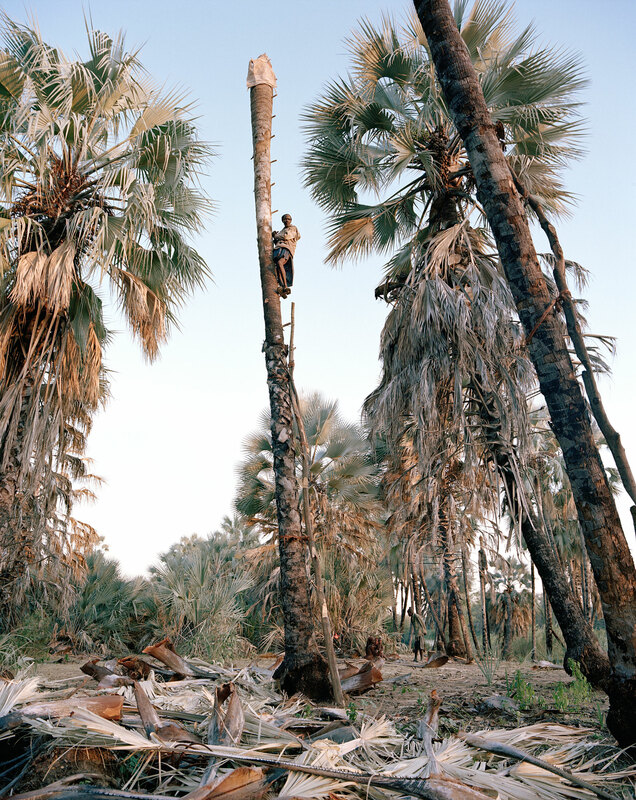 At the time the area was suffering a major drought and many of the Himba people had moved to the river’s edge for water and the nourishing qualities of Otusu, the local palm wine. 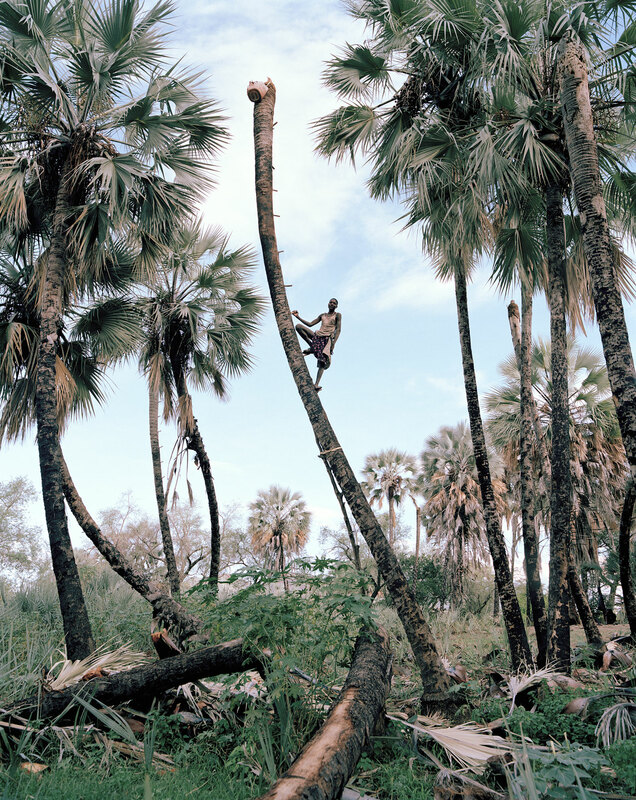 Travelling downstream, I watched as the palms were being tapped by the Himba men – a practice banned by the Namibian government – and decided to produce a series of portraits of the collectors. By photographing each one in a neutral way, standardising the framing of each shot, I found I could provide the subject with ample space to perform for the camera. 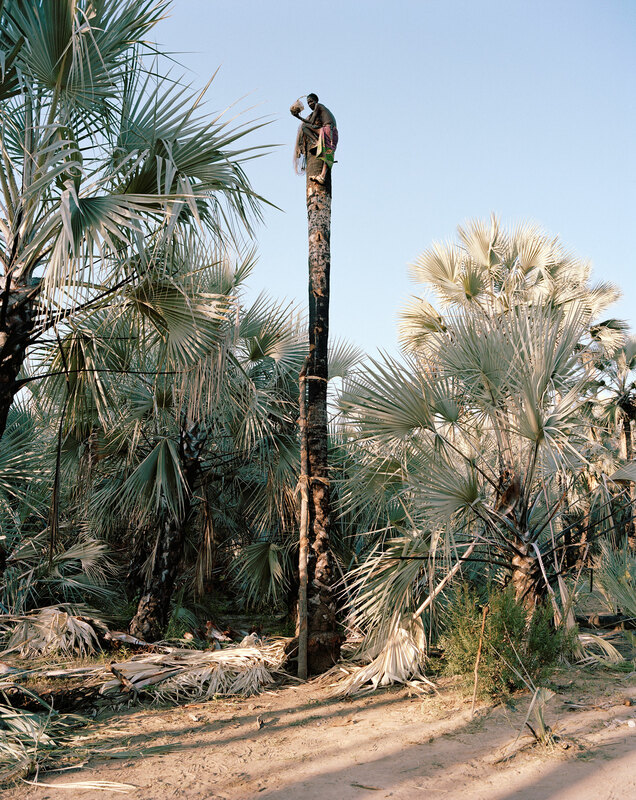 The ancient cultural practice of tapping Makalani palms has been banned by the Namibian government, but the practice is continued by collectors determined to maintain a tradition that promotes conservation on a cultural level. Together with my translator I was able to freely interact with the men, discussing the production of the portrait – I would first take a quick shot on my digital camera to show them, before taking a proper image with my analogue – and directing them where needed during the shoot; but the challenge was in finding the palms in the first place. Usually the palms are hidden from the road, so I spent a considerable amount of time exploring the area by foot. Having visited the area periodically over the past four years I’ve become aware of a rift between the representation and the realities of Himba people. The practice of photography has a complicated history on the African continent, but it is now shifting from being a tool of oppression, as it was during colonialism, to a means of empowerment and self-expression. Today, contemporary African photography aims to establish new narratives and identities, both personal and cultural, and I hope to produce photographs that empower the subjects by highlighting the dynamism of their culture. Anabasis, from the Greek word ana, meaning to step or march, is an expedition from a coastline up into the interior of a country. Tobias Harvey explores the Maunsell Forts and surrounding coast with various autumn/winter collections.